Evergreen trees provide year-round color and beauty to many areas of the landscape. The Canadian hemlock, also known as the Eastern hemlock, reaches a mature height between 30 and 80 feet. This attractive evergreen tree forms a classic pyramid shape in cool to moderate climate zones. Canadian hemlocks provide strong windbreaks and majestic focal points in yards and parks. Correct planting techniques encourage healthy future growth in your Canadian hemlock tree. Select a suitable spot in your landscape to plant your new tree. 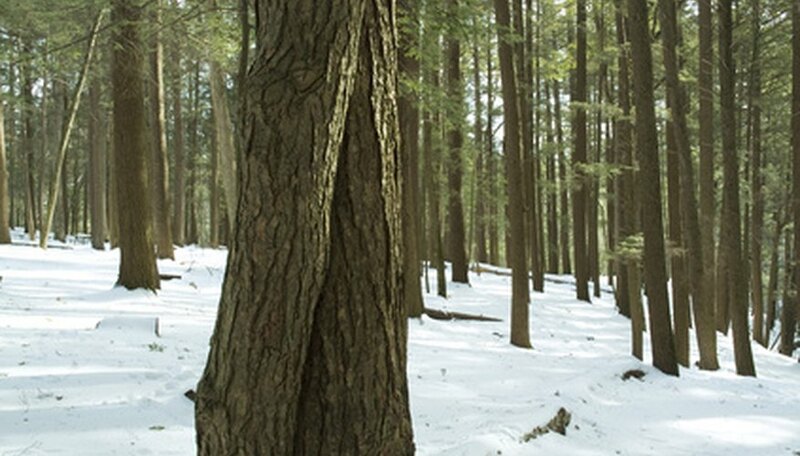 Canadian hemlocks prefer areas that provide full sun or partial shade. Avoid planting your tree in a low area that collects rain or continually exposes your tree to damaging winds. Loosen the soil in your selected site. Check the soil composition for good drainage. Canadian hemlocks require cool, well-drained soils. Incorporate sand and compost into heavy clay soils to provide good drainage and increase the level of soil nutrients. Use a garden shovel and thoroughly mix your soil additives with the existing soil. Incorporate this enriched soil to the depth of the rootball, extending three to five times the root ball’s width. Dig a hole in the middle of your prepared soil. Make the hole deep enough for the root ball. Keep the level of the surface of the root ball even with the surface of the surrounding soil. Place the root ball into the hole and backfill with your prepared soil. Press the surface of the soil to firm down and remove any air pockets. Build an earthen well around the base of your Canadian hemlock’s trunk. Create a 3- to 4-inch high dam above the outside circumference of the buried root ball. Use this circular area to hold in moisture when watering your tree. Lay a 3-inch layer of organic mulch over the soil below your Canadian hemlock. Keep the mulch a few inches away from the trunk of the tree. Canadian hemlocks, like many types of evergreen trees, suffer from various types of fungal diseases. Allow necessary airflow to the entire trunk by avoiding contact between the bark and the mulch. Water your tree immediately after planting. Canadian hemlock trees require moist soil to thrive. Check the soil frequently and add water whenever you notice signs of dryness below the mulch. Increase frequency of watering during extreme heat and drought. Fertilize your Canadian hemlock once each year with a fertilizer formulated for use with evergreen trees. Avoid planting your hemlock near large trees. Trees tend to compete for surface nutrients in the soil.